The ultimate gift for the food lover. Created to enhance flavors, take your food to the next level., With, easy to follow video recipes just 15 minutes to create new plates. We want you to experience Spanish Gourmet food the ChefOle way by learning all that needs to be known about each product. We are a creating a cultural atmosphere an adventure through times. Empower yourself the ChefOle way. 1-HOJIBLANCA Oil. This oil is golden, soft and slightly sweet flavor with a fruity aroma and a fresh grass, slightly bitter taste reminiscent of avocado green fruit, slightly spicy in the throat, with an end of almonds. 2-De la Vera Spicy Paprika.It is a seasoning powder with deep red color and spicy taste. Our Paprika has a tradition of more than 130 years following original quality process. 3-MANZANILLA OLIVE PATE.Our premium table olives are combined with extra virgin olive oil from Bajo Aragon to create a delicate and succulent green olive pate. 4-CITRIC SALT FLAKES.The salt is composed of sea salt flower, orange, lemon and limes peels. 5-Artisan Crunchy Bread Snack.Panacea breadstick is a healthy snack, made exclusively with first quality ingredients and maintaining the traditional methods of its origins. It is characterized by its irregular form, typical of artisanal manufacturing, and a perfect baking, which provides its appetizing roasting. 6-PEDRO XIMENEZ balsamic Cream.Elaborated from the slow reduction of the 100% must of the sweet grape Pedro Ximénez.Description: Very dark mahogany color. Dense texture typical of a cream. rich in flavors and aromas. Our company's mission is to supply top quality gourmet artisan products. 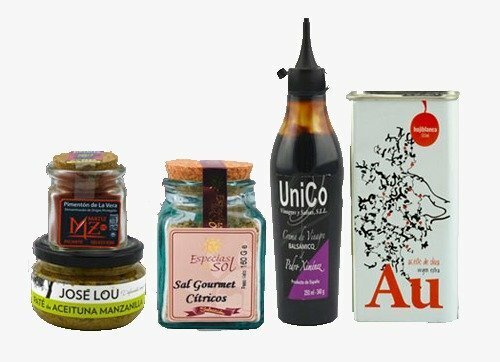 FOODIES GIFT CHOICE : 100% natural, NO GMO, Artisan made, 100% product from Spain. 1- Extra virgin Olive oil ,HOJIBLANCA variety,First press oil , company with 200 years tradition.17.6 Oz. 3- Manzanilla OLIVE PATE , Just Manzanilla olives and extra virgin olive from Bajo Aragon.4.23 Oz. 5- Crunchy Special Bread Snack . Made with mother yeast, 5.29 Oz. If you have any questions about this product by Chef Ole, contact us by completing and submitting the form below. If you are looking for a specif part number, please include it with your message.